The numbers reported by the Higher Education Statistics Agency (HESA) show that in 2010 about 15% of students graduating from British universities received a First Class degree, which had made some commentators uneasy. Last year those figures were up to almost 25%, possibly providing a useful indication that grade inflation is a problem. Some alternative explanations trying to account for this massive increase in just a couple of years is some combination of a) later cohorts are somehow smarter than previous cohorts (which seems unfounded), or b) a more competitive labour market has made students across the board exert more effort, and so performing better. a) pressure from students, showing up in classrooms arguing for higher grades. Since time is valuable, it's sometimes easier for lecturers and professors to simply raise the grade and move on. At teaching-intensive colleges and universities, in particular, student evaluations are often of paramount importance, and faculty members must do what they can to keep their customers happy. Many faculty members feel, and numerous studies seem to suggest, that generous grade distributions correspond to positive teaching evaluations, so many faculty members, under pressure from administrators to produce good evaluations, feel a temptation to inflate grades to secure their own livelihoods. Some faculty who wish to curb grade inflation may feel that they are the only ones fighting the problem. If everyone else is giving out inflated grades, why should they be the ones to stand alone, only to incur the displeasure of students who may be confused by inconsistent standards? 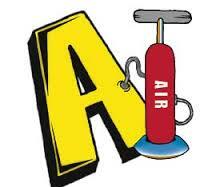 when they inflate, they all bunch into the A-range. Dispersion decreases, and grades are increasingly less useful at distinguishing between excellent and average student performance. The signaling value of an A is undermined if A’s are ubiquitous. So all these A:s and Firsts flying around are now less valuable. But maybe it doesn't matter, says a self-described grade-inflation warrior, suggesting that grades hardly ever have their intended motivational effects. Moreover, employers and grad schools admissions have already moved away from looking at grades in favour of many other things: references, connections, prestige of your university, extracurricular activites and other achievements. Maybe my indignation of sharing my not-so-valuable degree classification with tons of people is misguided, ultimately just a side-show? If so, then knowledge, achievements, employments and publications are gonna matter so much more. When governments and institutions have done such a good job at diluting the signalling value of universities, those of us who wants to signal our abilities simply have to move on to the next thing. No biggie. Update (2016-06-22): I'm glad to see that the University of Glasgow's own data show exactly what I was arguing; my facebook feed wasn't just a sample that was off-target, the University is dishing out First and Upper Second degrees like crazy. 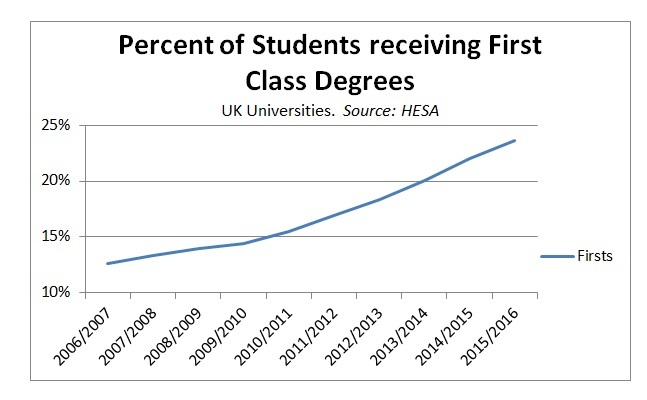 Last year 20% of all degrees in the Social Sciences, and even 30% in the Arts were First Class Let's just say degree inflation is rampant. Thanks, Uni, for eroding the value of my academic achievements!